Injections are among the most common health care procedures, with at least 16 billion administered in developing and transitional countries each year. 95% of injections are administered in curative care, 3% are for immunization, and the rest for other purposes, such as blood transfusions. 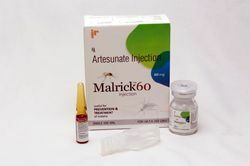 Jackson & Rickson provides wide range of injectables targeting various health problems and infections with the usage of best quality Raw materials. Banking on vast experience, knowledge and understanding of this domain, we present clients with superior quality of Rickzole-T. Used for treatment of Baldness and Discoid lupus erythematosus, the rickzole-t is procured from trusted vendors. In addition to this, rickzole-t is used for treatment of hard prominent irregular scar tissues in the skin. 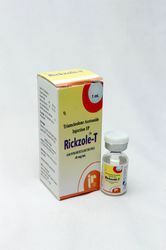 Rickzole-T is a synthetic corticosteroid and is given in many situations where a lasting corticosteroid effect is required. This includes replacement therapy in people whose adrenal glands are not producing enough natural steroids (adrenal insufficiency) and decreasing inflammation in certain disease states. Leveraging by the vast experience of this domain, we present clients with the superior quality of Rickzole-t. For treatment of baldness and discoid lupus erythematosus, the offered Rickzone-t is used. Appreciated for its compositional accuracy, quick results and enhanced shelf life, the rickzole-t is procured from trusted vendors in order to ensure high standards of quality. 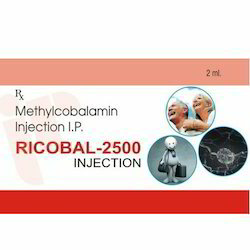 We are offering an exceptional quality range of Ricobal-500 Injections. These products are formulated by using premium quality raw material and modern technology. Furthermore, these are highly suggested for their conformity with set quality norms & standards and easy accessibility of offered product variety in the marketplace. These products are also delivered at clients doorsteps on time. For faster results to fight severe malaria & its complications ! ! Looking for Pharmaceutical Injectables ?